$10 Gift Certificate for 2, $5 for one. 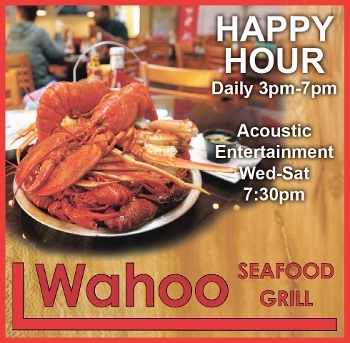 What special at Wahoo Seafood Grill would you most likely try first? Which Happy hour special would you most likely order? Which of Wahoo's Specialty Boils would you most likely pick? a. 'Super Boil' that includes lobsters. b. 'Low Country' that adds smoked sausage. c. 'Shrinp and Snowcrab' d. 'Swamp' that adds crawfish e. 'Snow Crab', 3lbs.